Laser based projects used to be expensive, until the development of solid state lasers. This project is designed for the entry level laser experimenter. The circuit allows any two computers with serial (RS-232) communication capability to communicate over 200 meters using a laser beam. A low cost transmitter only circuit is also presented here for use in one way communication and other laser based projects. If you are like me and always wanted to buy a laser pointer to play with, but could never find practical uses for one, here are a couple of circuits to convince you to finally make that purchase. Before we begin, however, it is necessary to give a word of warning: Never look directly into the laser beam as eye damage may occur. I will present the project in 2 sections: the first is a full-duplex transceiver, and the second is a transmitter only. The main reason for separating the design is to offer a cheaper solution if only half-duplex communication is required. For full-duplex communication 2 transceivers and 2 lasers will be required, and for half-duplex communication a single laser, a transmitter and a transceiver is needed. The transmitter can be also used as a stand-alone circuit if you only want to control the laser in other laser experiments. This view shows the assembled transceiver. In this photograph you can see the conductive dummy battery used to reach the negative contact inside the case of the laser. The laser source for this project is an inexpensive laser pointer pen. As well as being readily available, the circuit is designed in such a way so that the laser pointer is not damaged, and can be used for other experiments. Because this is an entry level circuit, costs have been kept to a minimum around $20 for the transceiver and approximately $10 for the transmitter (excluding the laser pointer). Why use a laser? A laser as a communications medium has some unique properties compared to other forms of media. A line-of-sight laser beam is useful where wires cannot be physically connected to a remote location. A laser beam, unlike wires, also does not require special shielding over longer distances. Lasers offer at least an order of magnitude longer distances compared to infrared LEDs. Although RF transmitters may offer longer distances than line-of-sight lasers, they are subject to interference from other transmitters. Since the laser medium is line-of-sight and the beam being only several millimeters in diameter it is very difficult for the data stream to be tapped. This offers secure communication since any attempts to intercept the laser beam would be detected at the receiver as a loss in data. A laser medium also allows for the sender and receiver to be galvanically isolated from each other. The transceiver is based on the MAX232A IC for generating and receiving RS-232 compatible voltage signals. The receiving sensor is an NPN infrared photo-transistor (OP505A). I chose an infrared photo-transistor to minimise ambient light interference. Although the laser wavelength is in the visible spectrum (~670nm) the photo-transistor’s broad response band (550nm to 1050nm) is wide enough to sense the intense laser beam. The signal from the photo-transistor is buffered via a pair of Schmitt trigger buffers to clean up and square the signal. The output of the second buffer is then directly converted to a RS-232 standard signal via the MAX232A. The MAX232A generates +10V and -10V voltage swings using a dual charge-pump voltage converter from a single +5VDC rail (see RS-232 standards below). Several different versions of the MAX232 chip exist. The A version requires only 0.1 uF capacitors for the charge-pump and inverter, whereas the MAX232 requires 1uF capacitors. The advantage of the A version is that it has faster response times, and allows for faster data rates. Figure 1. The schematic of the transceiver. The MAX232A IC provides the interface to the PC, and the 74LS05 is used to drive the laser diode inside the laser pointer. The laser diode driver consists of a 7405 open-collector hex inverter IC. All the outputs of the inverters are coupled together to provide enough drive current for the laser diode which draws around 35mA @ 3V. A 7805 voltage regulator is used to provide the IC and laser diode with a stable 5V voltage source. The two 1N4001 diodes, in series with the laser diode, step down the voltage from +5VDC to around 3.6VDC which is close to the nominal voltage for the laser diode. The transceiver is designed in such a way that when no signal is present the laser is on. This helps you see where the laser is pointing during the laser-detector alignment. The transceiver is powered by a 9V battery and draws approximately 80mA (laser on) and 40mA (laser off). The transmitter differs from the transceiver in the fact that it can only transmit data. The transmitter consists of an opto-isolator and an open-collector hex inverter and a handful of other components. The transmitter is also powered by a 9V battery and draws approximately 70mA (laser on) and 30mA (laser off). Figure 6. Here is a close up of the assembled transmitter. The transmitter accepts both RS- 232 and TTL compatible signals as inputs. The circuit uses an opto-isolator (4N33) to couple a standard RS-232 signal from a computer to the driver section of the circuit. The resistor/diode configuration at the input to the opto-isolator converts the +12/-12 voltage swings of a RS-232 signal into a signal suitable for the LED in the opto-isolator. A second input on the board is also provided for external TTL compatible signals. This can be wired to the parallel port of the computer or other microcontrollers. Note: Never use the TTL input signal at the same time as the RS- 232 input signal as these are shorted together only via a resistor. Figure 2. The circuit diagram of the transmitter. The laser diode driver is identical to the driver in the transceiver. The bi-polar RS-232 signal is converted to a TTL compatible signal via D3, R1 and the opto-coupler. The laser diode driver section is identical to the one used in the transceiver. The driver section of the transmitter is also designed so that the laser is on when no data is present to help point the laser. Construction of both the transmitter and transceiver is fairly straight forward so I will describe them together, pointing out the differences when needed. First start by checking the PCB to make sure it is clean and free from dirt. Next mount all the passive components, this includes the resistors and capacitors. You can now mount the diodes taking note of their polarity. Next fit the active components, this includes all the ICs and the voltage regulator. The voltage regulator does not require a heat sink, so it can be placed flush against the PCB. The ICs may be mounted in sockets or soldered directly to the PCB. Now fit the pin-headers to the appropriate holes on the PCB. If you prefer not to use pin- headers and connectors, you may solder the wires of the external components directly to the PCB. Now you are ready to start attaching the external components. These include the laser pointer, photo-transistor, battery connector, switch and the DB-9 connector. I will leave it up to you as to how you want to house the project, but I suggest that you use a zippy box so that you can mount the photo-transistor and switch. To mount the photo-transistor, you can simply drill a snug hole in the side of the zippy box and use that to secure the photo- transistor. Alternatively a block of plastic or wood, with a hole drilled in it for the photo- transistor, can be attached to the top of the zippy box. The advantage of the block is that it shields the photo-transistor from ambient light. Take particular care with the orientation of the photo-transistor when clipping the pins and soldering wires to it. Figure 3a & 3b. Here are the PCB patterns for the transceiver and transmitter for those who want to make their own. The layouts are copyright to GKDesign. Now you need to prepare the serial connector. You may use a standard (female) DB-9 or DB-25 connector depending on your needs. I will describe the connections for the DB-9 connector as this is found on most IBM-PCs. (See Fig. 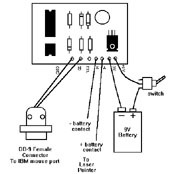 8 for the connections to both a DB- 9 and DB-25 connector) The IBM PC serial port contains several data and handshake lines. We will only be using the Transmit Data (TD), Receive Data (RD) and common ground (GND) lines. Handshaking will be done in software. In order to make the serial port happy we need to connect the Data Terminal Ready (DTR) line to the Data Set Ready (DSR) and Data Carrier Detect (DCD) lines. We also need to connect the Request To Send (RTS) line to the Clear To Send (CTS) line. This has the effect of tricking the serial port into thinking that it is always ready to receive and send data. These links should be soldered inside the connector itself. Only 3 wires are required for the connection to the transceiver. Connect the three wires to the RD (pin 2), TD (pin 3) and GND (pin 5) lines of the connector. For the transmitter, wire only the TD (pin 3) and GND (pin 5) lines. A length of 4 core flexible telephone cable works great. Make sure no one is using the phone at the time! Again ensure that the wires are correctly wired to the PCB. Figure 8. This solder side view shows how to wire the DB-9 (female) or DB-25 (female) connector for an IBM PC compatible computer. Next connect the black wire of the 9V battery clip to the PCB and the red wire to one contact on the switch. The other switch contact should then be wired to the PCB. You can use light duty hook-up wire to achieve this. The last, and most interesting, component needs to be wired to the circuit - The Laser. We must first prepare the laser pointer since almost none have wires already hanging from them. The preparation will vary on the laser pointer you have, but most should have access to the battery compartment. The most suitable laser pointers are the ones that require 2 AAA or 2 AA batteries. The laser pointer used in this circuit is the LX1000 purchased at Radio Shack. First remove the batteries carefully noting the polarity of the contacts. You now need to connect a wire to each battery contact. Depending on the laser pointer case you may need to create a conductive dummy battery in order to reach the contacts. For the laser pointer used in this design, in order to reach the negative contact deep inside the case, a metal rod was cut to the length of both batteries and a wire was soldered to the end of it. The rod can be made from a bolt or large diameter nail with the head cut off. The rod was wrapped in electrical tape to insulate it from the aluminium case which formed the other contact. An exposed wire was taped to the insulation of the rod so that it made contact with the case when the rod was inserted. This made the positive contact. Figure 4a & 4b. Connections to the external components are shown here for both the transceiver and the transmitter. One more step and we are ready to use the laser. Usually most laser pointers have a push- on switch to turn on the laser. This switch can simply be taped down with electrical tape to hold it closed. (Where would we be without electrical tape?) The laser pointer is now ready for use. Again it is very important that you get the correct orientation of the wires from the laser pointer when connecting them to the PCB. See Fig. 4a for correct wiring. You will need a PC to test the circuit. The program listing at the end of this article gives an example of a test communications program. You will need a C compiler to compile it. The code was compiled using Borland C++ 3.1. If you do not have a compiler or wish to obtain the executable version of the test program you can find it on my web page. To test the circuit, plug the DB-9 connector into the mouse port on your PC. Turn on power to the circuit and the laser should switch on. Now turn on the PC and make sure a mouse driver is not loaded. A TSR(Terminate and Stay Resident) mouse driver will interfere with the operation of the circuit. Also make sure that no other TSRs are attempting to use the serial port. Now point the pointer directly at the photo-transistor. Next run the test program from a DOS prompt by typing LASER 1 and pressing the key. Where 1 represents the COM port number the circuit is connected to. Anything you type on the keyboard should appear at the top of the screen as well as the bottom. The top part of your screen displays the data sent out over the laser pointer while the bottom part shows the received data. Press the ESC key anytime to end the program. To test communication between two computers simply repeat the steps above for each computer except that the lasers are pointed towards the other transceiver. Over longer distances I have found that it is much easier to fix the laser and move the receiver in order to align them properly. For this reason the laser should not be attached to the zippy box housing the photo-transistor. Also depending on the laser pointer, beam intensity and beam spread will vary which will affect the distance over which reliable communication can be achieved. Most laser pointers should achieve a minimum of 100 meters. And if all goes well you will be sending data over a laser beam! Using the sample code it is now up to you to write the program for your needs. RS-232 is a standard for transferring data in serial format. Information is sent in small packets of data called data frames. A data frame consists of the following sequence: a start bit, the actual data word, an optional parity bit and ends with one or two stop bits. The data word can be 7 or 8 bits long. RS-232 offers asynchronous communication with the combination of start and stop bits of being used to synchronize each data frame. The parity bit is used by the receiver to determine if an odd number of bits were corrupted during transmission. There are two types of parity, odd and even. For example, if even parity is used the transmitter makes the parity bit a 1 anytime there is an odd number of 1’s in the data word. This makes a total even number of bits in the data frame. If an odd number of bits arrives at the receiver then the data frame was corrupted. The standard not only specifies the order of bits but also specifies the voltage levels used to send the data. Bipolar signaling is used in the RS-232 protocol to support long cabling with minimum noise. A logic 0 is represented by a positive voltage between +3VDC and +15VDC and a logic 1 is represented by a negative voltage between -3VDC and -15VDC. The IBM PC serial port contains a number of handshaking lines that are used to indicate the willingness of the receiver to receive data and the sender to send data. These are not strictly needed and so I will not cover them here. The laser experiments do not have to end there. You can use the transmitter section of this design to create laser light shows. Attaching mirrors to servo motors and pointing the modulated laser beam at them you can create patterns and images. RS-232 Laser Transceiver electronic circuit. PC related electronic circuits and schematics.